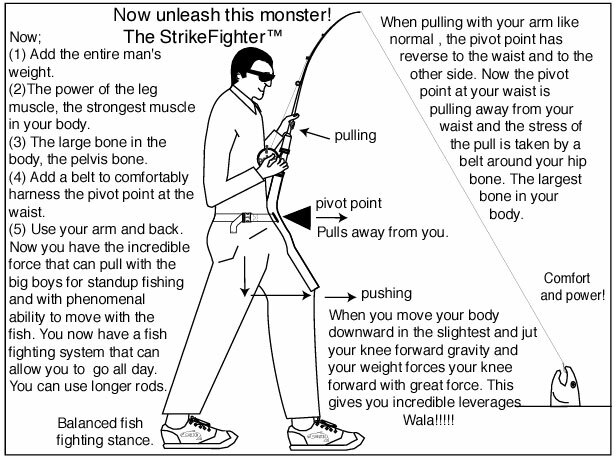 StrikeFighter™uses your body weight to fight fish. The StrikeFighter� sitting model is fantastic for one or two arm fishing in a wheel chair while using standard fishing gear. 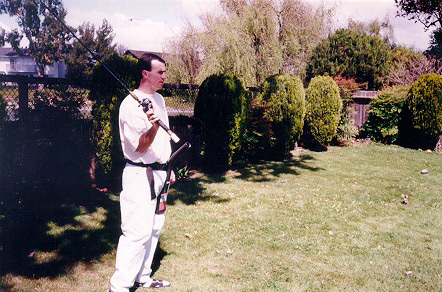 The StrikeFighter� pumps your rod from using either your arm, lift leg or upper body rocking movement. 3 totally different ways to pump rod. For 2-arm angler it operates as a base and pivots and fights fish without removing from StrikeFighter�. 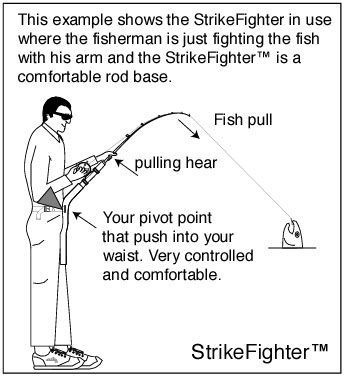 For a one arm angler you can use the available arm to strike, or if you have movement in one leg, it can be lifted to strike, or if you have upper body movement of leaning back and forth can operate the StrikeFighter (upper body strap included). 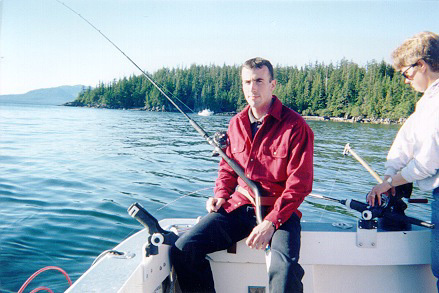 You can use any combination of the above methods and handle small to large fish. Its amazing how easy you can pump the rod and still retain striking and fighting abilities. Cast with the available arm, then insert in the StrikeFighter� horn and start reeling in or wait till you get a bite. The StrikeFighter� takes the place of one arm and with uses it becomes as one with your body to perform as if you had the use of both arms. The StrikeFighter� is an extremely efficient tool. The StrikeFighter� is fantastic for one or two handed fishing while using standard fishing gear. 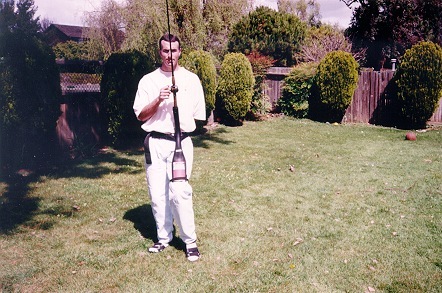 The StrikeFighter� takes the main work of pumping your rod from your arm to your legs and hips. Shifting your body weight from one foot to another or just slightly raising the leg that the StrikeFighter� is attached too does the work. Its amazing how easy you can pump the rod and still retain striking and fighting abilities. Handles trout to salt water fish. 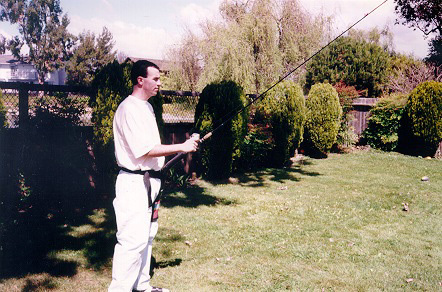 The StrikeFighter� holds your rod firmly so that you can reel one-handed. The StrikeFighter� takes the place of one arm and with use, it becomes as one with your body to perform as if you had the use of both arms. It works while lowering downrigger, standing, wading, trolling, baiting, striking, fighting, netting and removing fish. Your rod is always at your fingertips giving you sensitivity for bite detection. 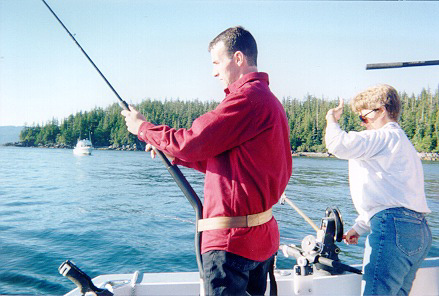 Directions for attaching a provided gimbal to your rod (Keeps your rod from twisting while reeling) are included. A straight handle rod is required. The StrikeFighter� has tremendous power. By using the law of physics, you turn you entire body weight against the fish, without stressing your upper back or arms. Its hard to imagine the power involved until you strap one of these incredible devices on. You want to fight big mean fish, the buck stops here. The StrikeFighter�, makes fighting large fish easy. The StrikeFighter� uses your leg movement and body weight along with your arms and back to assist you to fight fish. You can generate hard rod strikes. The StrikeFighter� holds your rod for you while doing many things, such as lowering your downrigger, sitting, standing, wading, trolling, baiting your hook, striking, fighting, netting and removing fish. Your rod is always at your fingertips and you have extreme sensitivity for bite detection even if you doze off. Flipping the StrikeFighter� sideways holds your rod out to the side for trolling. If you enjoy salmon fishing, the StrikeFighter� makes an excellent jigging and mooching aid. 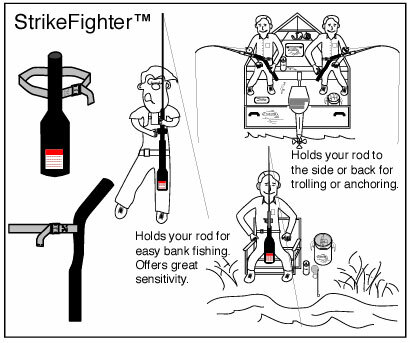 The StrikeFighter� is for all types of fishing. The StrikeFighter� makes the perfect fishing aid. If you are physically challenged with one arm, or have an injured arm, the StrikeFighter� allows you to control the rod as you would with two arms. Want to steady your arm for offhand shooting? You are in luck! (Requires a shooting attachment). StrikeFighter� with Bill Shelton Jr. standing ready for a strike. 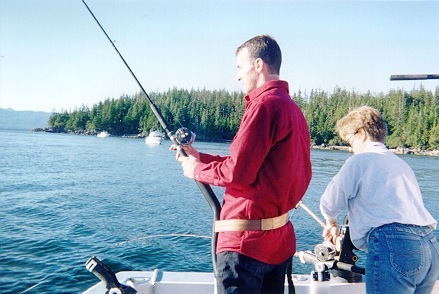 Fishing with North End Charters Ketchikan Alaska 907 247-8489 Ship Pattison and his wife are a great team to go fishing with. StrikeFighter� keeps you ready for action. Whether you are trolling for stripers, salmon, or just plain old bank fishing for trout or catfish, the StrikeFighter� can do it all. It is at home on a boat fighting tuna, wahoo or your favorite saltwater fish. When you wading for steelhead on the river, you can always use a StrikeFighter� to hold your rod. Wading in the ocean off the gulf? No problem! You need a StrikeFighter�! Sturgeon fishing at anchor sitting in the back of a boat? No Problem! Bank fishing while setting in a lawn chair? No problem! You have a full time rod controller strapped to your waist! You can use it while changing lures, netting fish or just taking the stress of holding your rod. Mooching, jigging and handling heavy weights and rods? You will want to have a StrikeFighter� with you. If you own a fishing rod, then you need a StrikeFighter�. 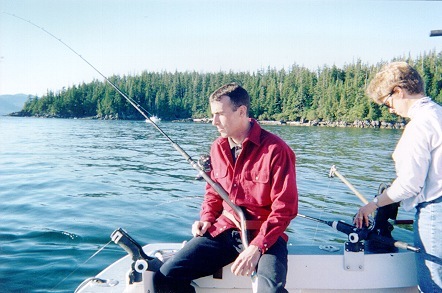 Fishing out the back of boat in a ocean, lake or river. Place StrikeFighter� between your legs and adjust StrikeFighter� easy adjusting belt for the correct fishing rod angle and for comfort. The slightest bite will transmit through the StrikeFighter� to you, so you can make that critical hook set. Spend your day watching the scenery, not zeroed in on the end of your rod. Feel relaxed all day long knowing that your StrikeFighter� is coiled like a rattlesnake and is ready to strike. 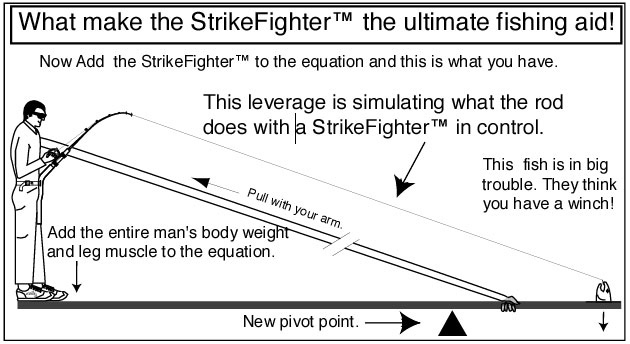 The StrikeFighter� is very simple. It is like a rod controller strapped to your waist, and has a unique patent pending design to be operated by your leg. 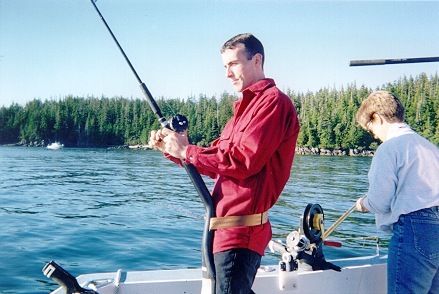 By changing leg positions you can pump your rod with incredible force. When not in use, you can slide the StrikeFighter� around to your side or back out of the way. If you desire to fight a large fish in a normal arm pumping manor, then the StrikeFighter� performs as a excellent base to do that with. You can also combine fighting fish in the traditional manor and when your arm gets tired, let the leg movement and the StrikeFighter� take over or help fight the fish. Why can a 70-pound fish wear a 170-pound man to a frazzle? Leverage! The fish has leverage. The illustration shows you a typical setup. Unleash this monster the StrikeFighter� into the equation and now the leverage reverses to the angler. (using the law of physics gives the angler the ability to use their entire body weight and leverage against the fish) That what gives the StrikeFighter� its incredible power. You can choose to use the StrikeFighter� incredible power or just use it as a very comfortable rod base and use your arms to fight fish. It gives you the flexibility to fight either way or a combination of the two. The StrikeFighter� slides to your side and while leaving your rod mounted in your StrikeFighter� allow you too have rail control to move with the fish. 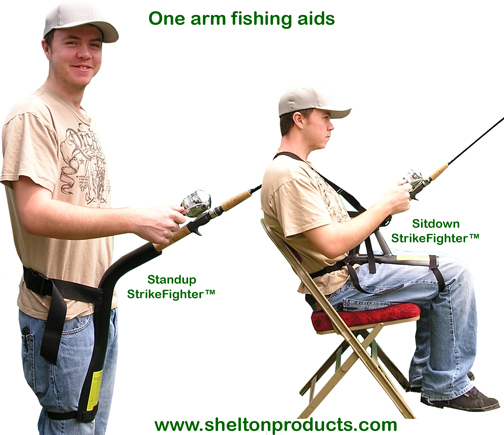 The StrikeFighter� can be helpful in sitting, trolling, standing, wading and serf fishing. It is truly one of the most useful fishing accessories on the market. 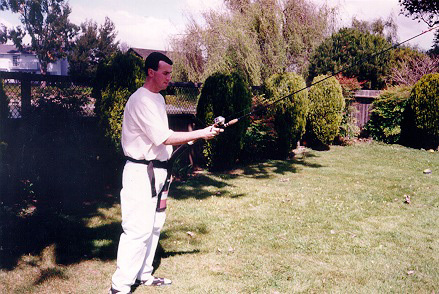 Billy Shelton Jr. demonstrating how a physically challenged person fishing with only one arm uses the StrikeFighter�. Inserting the rod in the StrikeFighter�. Reeling with the same hand while the StrikeFighter� controls the rod. 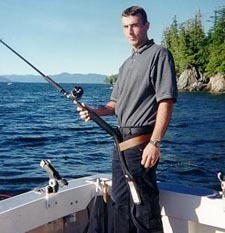 Physically challenged person fishing with only one arm can fish with a standard fishing rod and reel with ease. Just cast out and insert rod in the StrikeFighter� and reel in as normal. Upon detecting bite, you quickly lift knee of leg that you have the StrikeFighter� on and fight fish by actions described in the operating instructions. The StrikeFighter� for the physically challenged comes with a velcro leg strap and a gimbal that mounts on your rod to keep rod from twisting during reeling. This is design to work with straight handle rods only. You will be absolutely amazed at the StrikeFighter� performance. 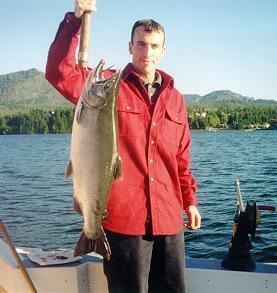 Bullet Rotator� Trolling for salmon Salmon trolling rig Bullet Rotator�.